The set is enhanced with a superior high-impedance monitor to protect data lines. Patent-pending power sharing circuitry shares power from the telephone line and the 9-volt battery for the longest battery life in its class. 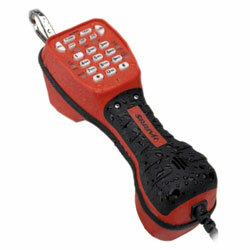 Over voltage and over current protection prevents damage to the unit when accidentally clipped to energized wires. The unit is even field software upgradeable for future enhancements and upgrades.